Sculptural brass table lamp featuring two leaf motifs and two light sources. Designed by Tommaso Barbi and made in Italy in the 1970s. European plug. 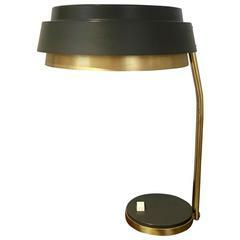 Table lamp from circa 1960s made in Sweden with brass and varnished metal. Minor age-related scratches and stains on brass. Table lamp designed by Tommaso Barbi made of brass and composed of one light point. For your consideration a brass table lamp after Tommaso Barbi. Solid brass with a large leaf brass shade. No stamp from the maker. Measures: 9" tall x 12" D x 7" W.
Tommaso Barbi ceramic table lamp signed. 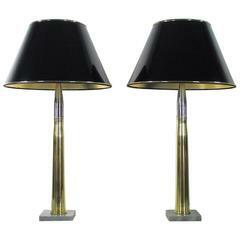 Pair of Tommaso Barbi leaf lamps in brass. Tommaso Barbi table lamp composed of two leaves and structure made in brass, contains one point light for each leaf, Italy, 1970s. Table light design by Tommaso Barbi composed of one leaves and structure made in chiselled brass, 1970s.